Published by Drummond Park Ltd.
Dinosaurs are cool. I have always loved dinosaurs. I mean, the day Jurassic Park was released was one of the best days of my childhood, and I still think it is one of the greatest films ever made (no matter how many people try to convince me it's Citizen Kane). So, if you are going to make a game about dinosaurs, and then put those dinosaurs in a futuristic war with humans, and give them guns, and make those guns really fire, then you, Sir, have my attention. Dinosaurs! Guns! Ned Kelly with a flame thrower! Oh, yes. 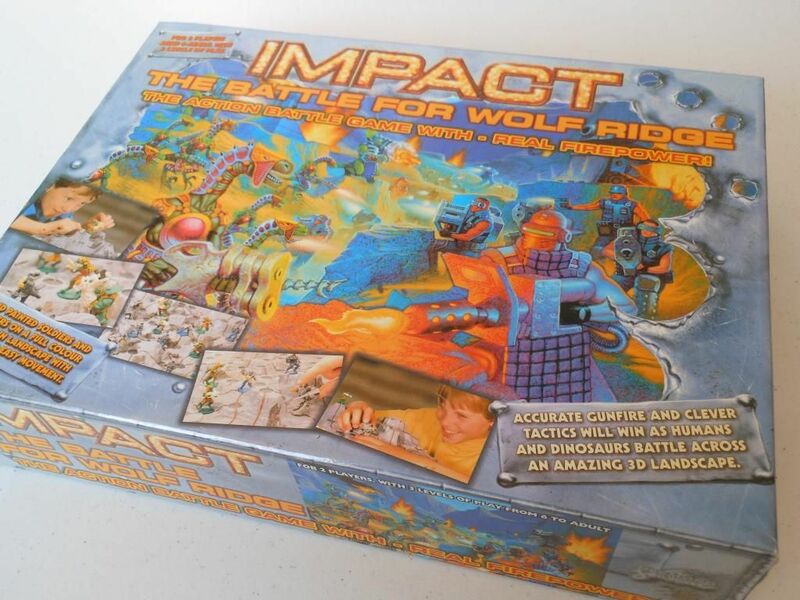 Impact: The Battle for Wolf Ridge is probably the most thematically awesome game that has ever been devised. Even the name is awesome. An army of dinosaurs with high-tech weaponry is invading Earth. They have sent out a scouting party, which has found an oil-rig in a location called Wolf Ridge. The humans operating the rig hastily fashion weaponry from their drilling apparatus, and prepare to defend themselves from their cold-blooded assailants. If you don't think that's the best set-up for a game ever, then you just don't appreciate awesomeness. Either that, or you're dead. I want to see this being made into a film. As you may have noticed, this game had me hooked on the theme the moment I saw it in my local charity shop, and I had to buy it, even though I suspected the gameplay itself would be dire. I am that sort of a guy. Luckily, I was pleasantly surprised. While the game does not live up to the awesomeness of the theme (what could? ), it is actually well designed. And, of course, it has dinosaurs with guns that really fire. Each model is well-sculpted, easily identifiable, and the paint jobs are surprisingly good. I particularly like the human gun units, which really look like they have been made from spare bits of the drilling rig. 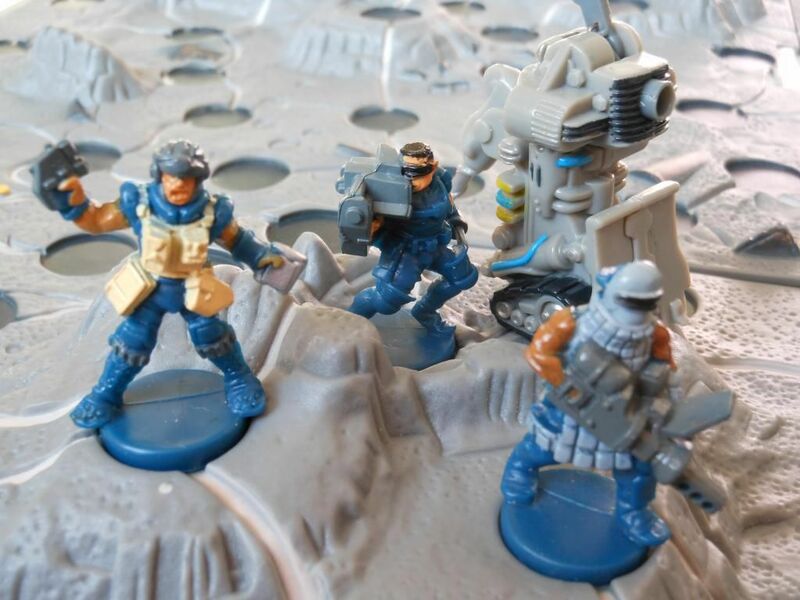 Apart the models, the only other game component is the board, which comprises four pieces of moulded plastic with circular indents to indicate spaces where units can stand, linked by routes those units can travel. It looks great when it is set up, and is just the right size for the skirmish-level battles you will be fighting. Okay, so in terms of "stuff in the box" you do not really get a lot: 18 figures and four board pieces. However, there is a decent amount of game crammed in there, including three levels of play that range from starter rules so basic you might fall asleep through to rules that are surprisingly involved. The rules book, with three levels of play. The intermediate rules add movement into the game. In turn, players move all their units, following the routes embossed on the board. You get to make twice the number of moves as the number of troops you started the game with (excluding your two gun units). If two of your units move adjacent to an enemy unit, the enemy is captured and removed from the board. After movement, players take turns to fire their guns. Any units knocked over are removed from the game. The first player to lose all six troops, or both gun units, loses the game. These intermediate rules are perfect for younger children, and offer enough options so that adult players can tolerate playing. Leaders can capture enemy troops single-handedly (but still need assistance to capture NCOs and leaders), and at least one leader or NCO must be present with any other unit in order to capture a gun. Question: What do dinosaurs have for lunch? These two additional troop types, and a few other minor rules tweaks, offer the most engaging experience, and actually make the game pretty entertaining. Notably, winning comes down to skill rather than luck, as there are no dice. If you aim well with your guns, position your troops to effectively use cover, and spring attacks at the right time to surround and capture enemy units, you will win. 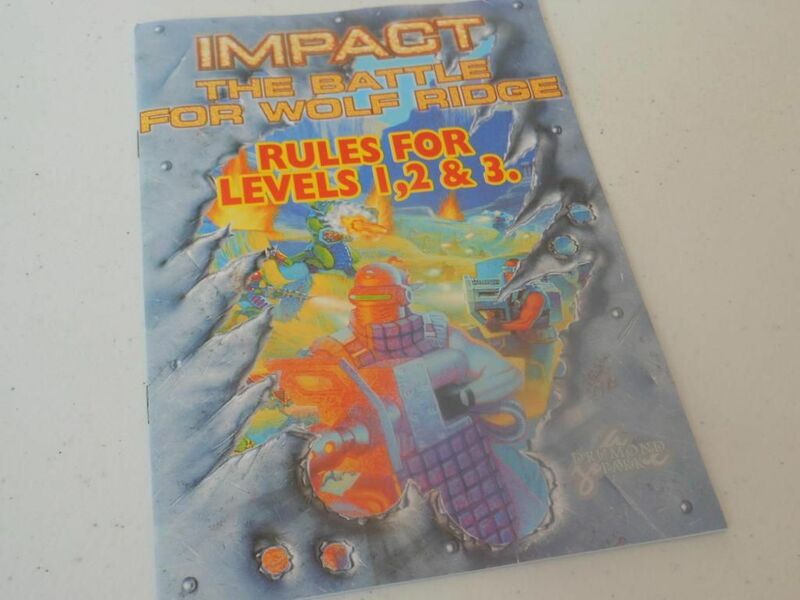 Of course, Impact: The Battle for Wolf Ridge is not without its faults. For a start, the game is definitely designed with younger gamers in mind. It is on the light side for a strategy game, and it has a rather limited scope. You can only have a maximum of four troops, two special units, and two guns on the field, because that is all you get in the box. 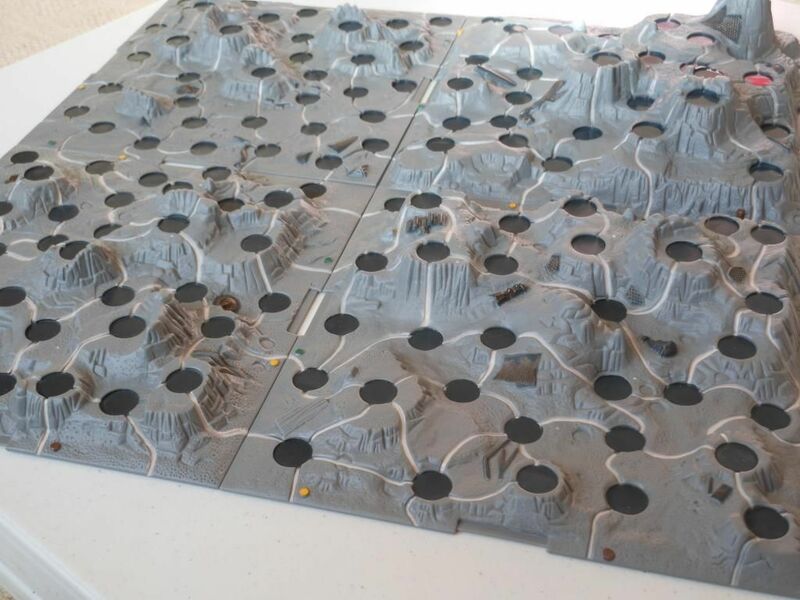 Furthermore, the small size of the board would prevent you fielding larger armies anyway. After a while, the game will start to feel a bit samey. Another problem relates to the gun mechanisms. They are a little fragile, and if you are not careful, the wires can snap or come loose. The biggest problem is that the game lacks a certain amount of focus, and therefore does several things moderately well without ever doing one thing that is amazing. The strategy element is good, but there are only limited options available due to the small number of troops and special abilities. Meanwhile, the dexterity bit where you get to fire the guns is cool, but with only two guns per side, it pales in comparison to something like Crossbows and Catapults. What we have here is a game that tries to be all things to all people, and ends up being less than the sum of its parts. So, at the end of the day, is it a good game? I don't know. I guess not really. But then again, it sort of is. I'll admit. I'm surprised. When I purchased the game, I expected it to be really dumb. However, the ridiculous (but awesome) theme, is a bit of a smoke screen, disguising a game that has more depth than you might imagine. Okay, it isn't chess; but you aren't just rolling dice and firing missiles. You really need to plan your moves carefully, take your time, capture enemy pieces when they are exposed, and watch out for counter-attacks. Which actually does sound a bit like chess, I suppose. But chess with dinosaurs. With guns. That really fire! Just bought a larger set (from a charity shop!) missing it's box, but I think it was the earlier version? 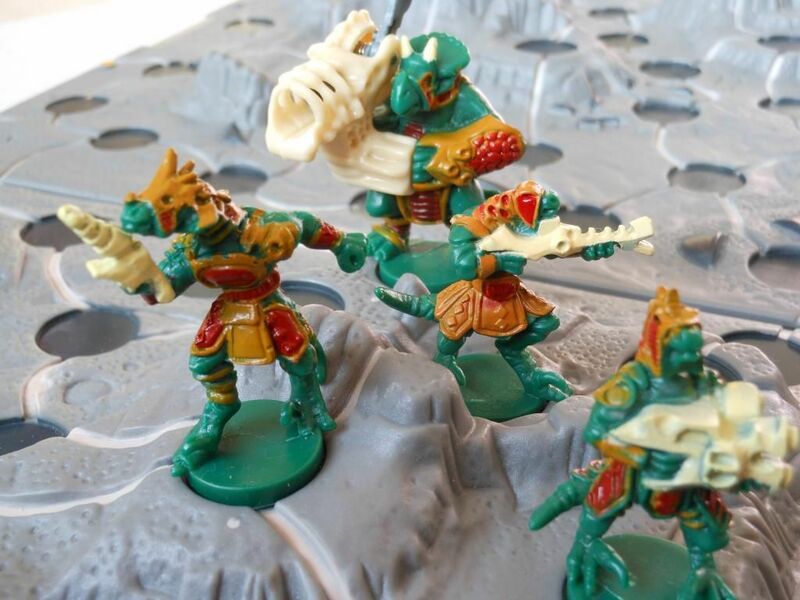 It has 6 flat card play-squares and 8-man (or dinosaur) armies (5 troops, 2 NCO's), the Dino's are all the same but the humans are different and in blue-green, I think the Dino commander is a new sculpt too? I lack your enthusiasm for the 'whole' though, and have kept figures, guns and missiles and chucked the rest in the recycling! Totally agree about the sentient Dino's with guns . . . that fire . . . thing! Hi, thanks for reading. What you have is Impact. 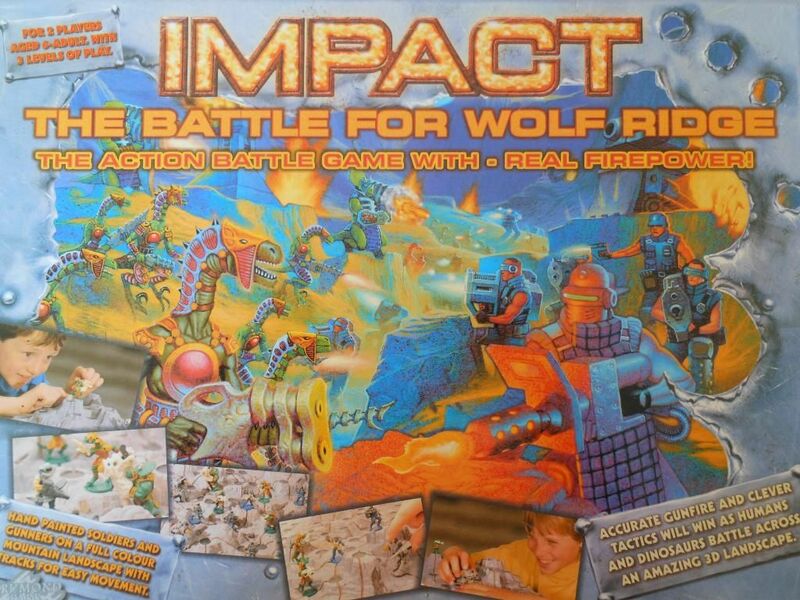 Impact came first, but both games were released in the same year. You can play them as standalone games, or integrate them for larger games.